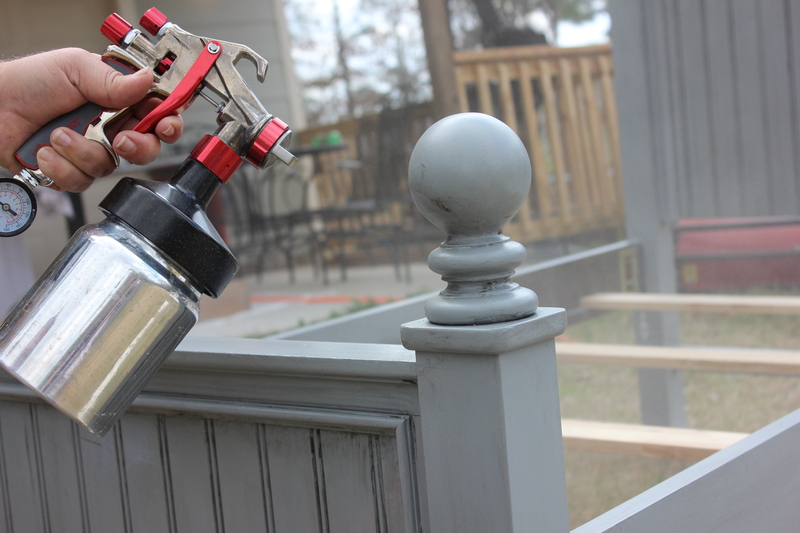 After trying three different types of paint sprayers to paint furniture, and hating them, we have finally found one that works for us. The fourth time is the charm. 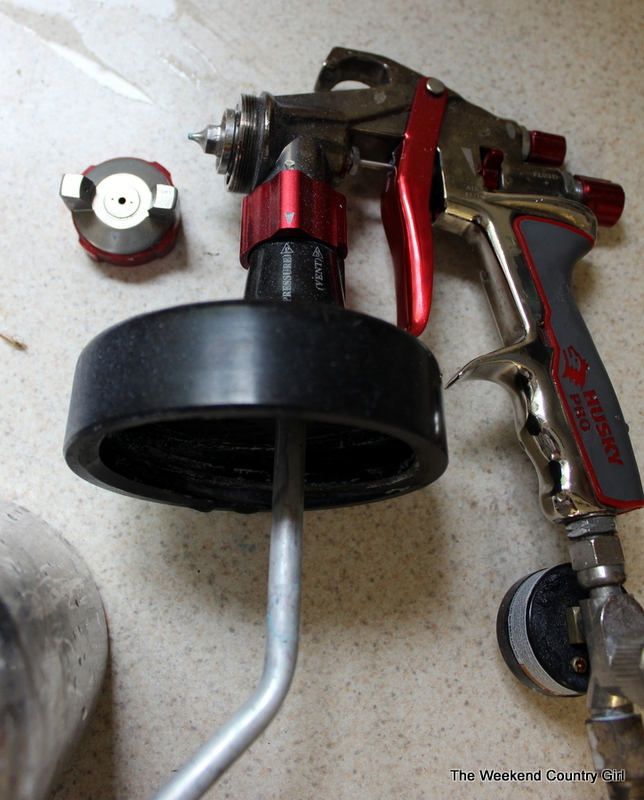 We like a gravity feed sprayer that runs off an air compressor. The brand we use is Husky- not a fancy name bran- and it was inexpensive. Like less than $60.00. 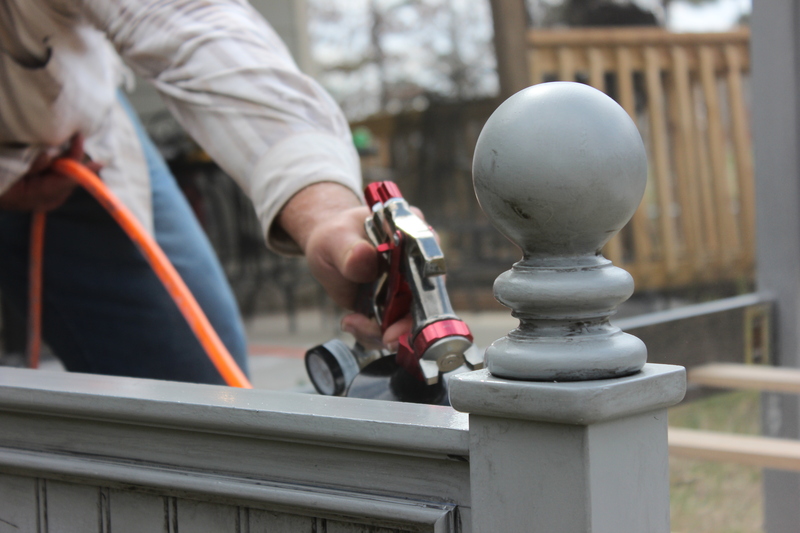 It works like a charm and we get a smooth finish with minimal drips. I can use it, except it makes me nervous to connect it to the compressor. Once I master that I will be good on my own. Learning to use a sprayer was not without a few errors and a learning curve. We learned that the paint needs to be thinned a little to make it flow evenly out of the sprayer and that made a difference. Buy good paint. It is tempting to try cheaper paint since it has to be thinned. Don’t do it, friends. I still use Behr Paint with primer when spraying. 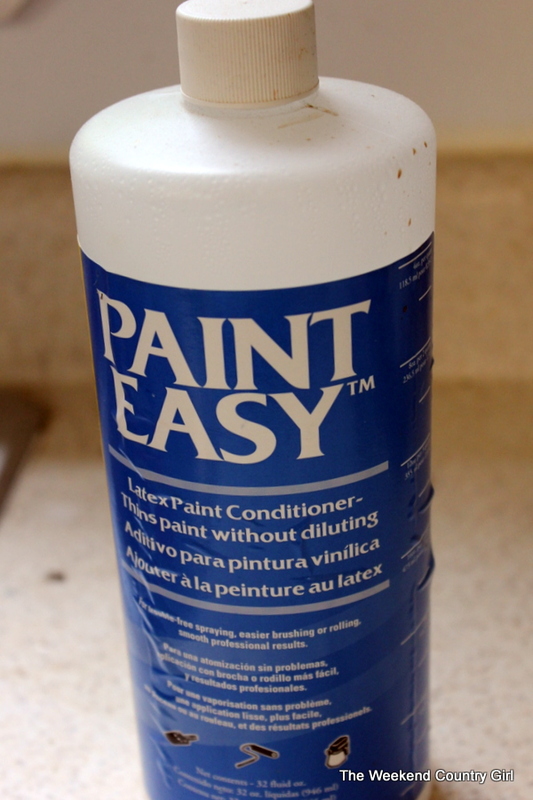 Use paint conditioner to thin the paint. We have used water in a pinch but I can tell the difference. 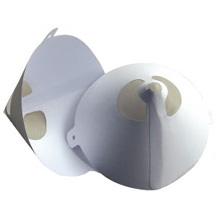 Get paint filters and strain your paint. You even need to strain brand new paint but you REALLY need to strain paint you have sitting on your shelf. They cost about $1.00 for five so it is a cheap investment. Hold the sprayer 6 to 8 inches from the surface you are painting and keep the sprayer moving while the trigger is pulled. Release the sprayer trigger when you change directions. Use a board or cardboard to test your sprayer before using it on what you are spraying, even if all you do is refill the paint into the can. The settings can move and could affect how much paint is coming out. Cleaning the sprayer is a pain in the neck, but it has to be cleaned to spotless every time it is used. Take it all the way apart to clean it. Here it is all taken apart. Plan on using at least 25% more paint than you would brushing it on. We underestimate a lot with the sprayer. I am not sure why it takes more paint, but it just does. You may see a dimpled appearance when the paint is wet. Don’t panic. Don’t try to brush it out. Leave it alone. Once it is dry it will be smooth. Be patient. This is what it looks like right after painting. I promise this look goes away. 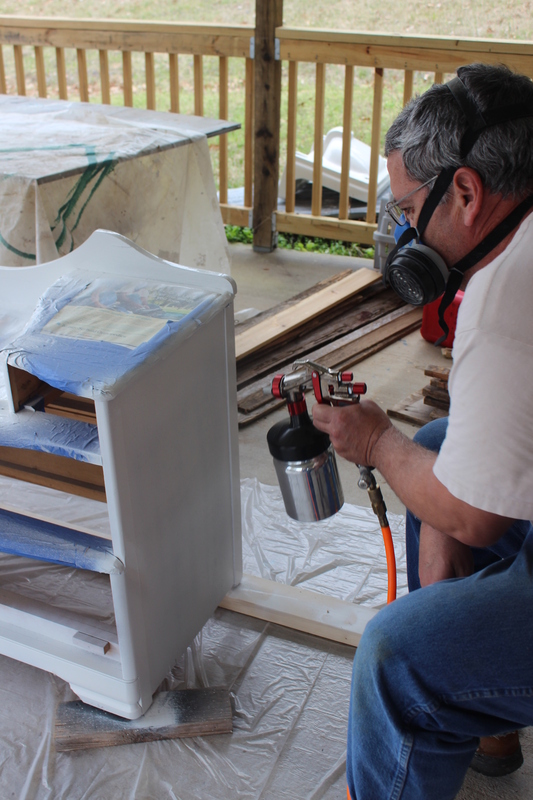 Hubby’s favorite thing to use the sprayer for is polyurethane. 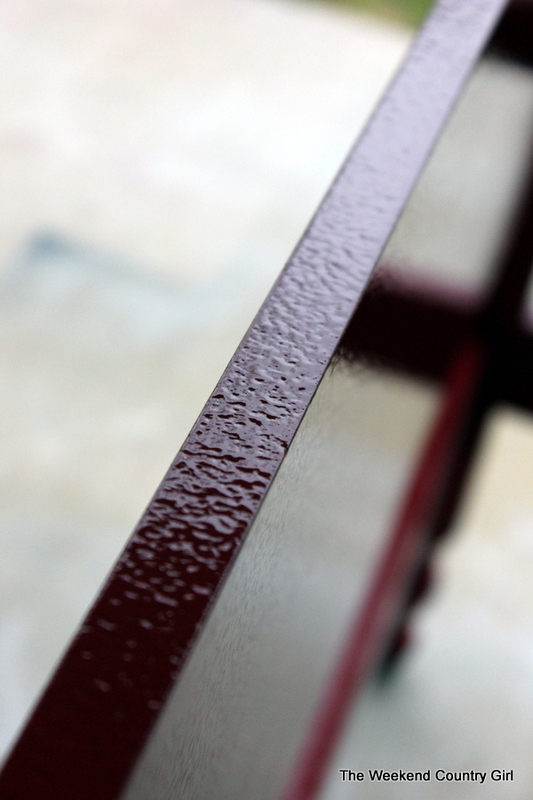 We only use water based poly because of cleaning but wow, what a beautiful finish. Poly is thin and does not need conditioner. I still like a hand brushed look on some items, but I will never hand paint a chair or table legs again now that we have discovered the paint sprayer. 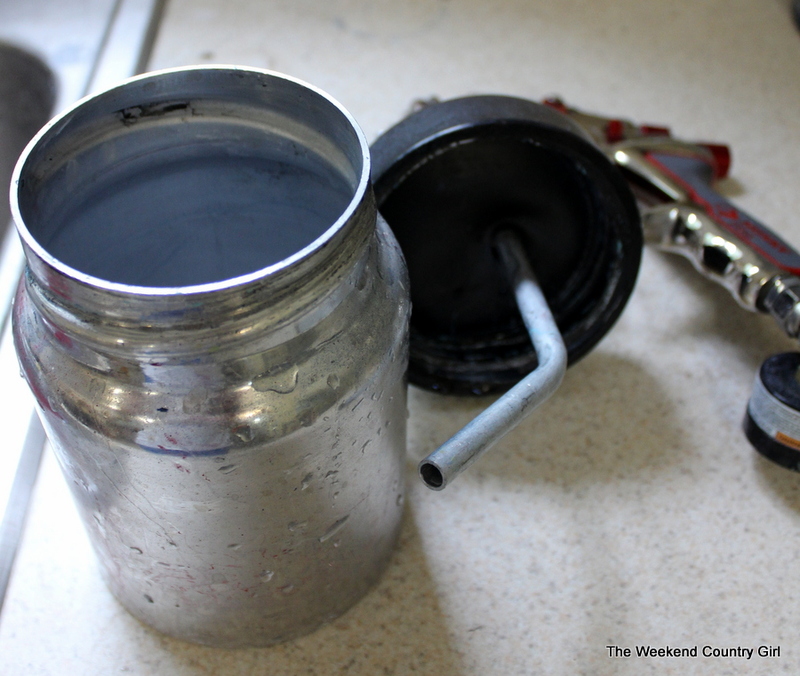 Great tips……I’m such a brush painter, tried and true, but have been dying to get a sprayer. What brand did you purchase? We got a Husky brand at Home Depot. I still like brush painting small pieces, but I am a sprayer convert. I rehab a ton of furniture in my workshop down in my basement. Most of the pieces I do are larger. Now that it’s getting warmer I may need to invest. Thanks again.